Junior outside hitter Millie O’Ketter, of Durango High School, attempts a kill on Saturday against Grand Junction High School at DHS. The Demons won in three sets. Paige Ammerman, left, and Taylor Wolf of Durango High School, attempt a block while playing Grand Junction High School on Saturday at DHS. 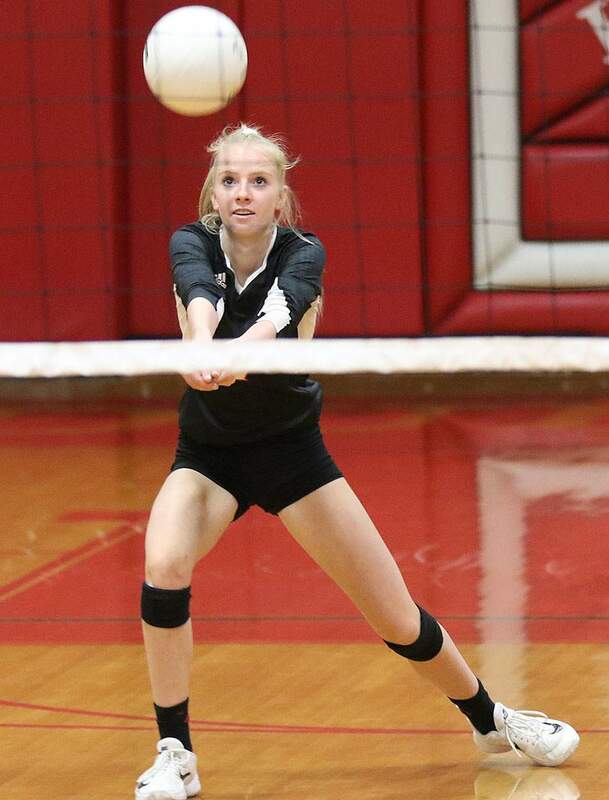 Lily Chick, of Durango High School, digs the ball while playing Grand Junction High School on Saturday at DHS. Durango High School volleyball’s junior outside hitter Millie O’Ketter hit a serving roll midway through the second set against Grand Junction Saturday at DHS and never looked back. O’Ketter led her team back from a 21-16 deficit midway through the second set and the Demons won 11 out of the final 12 points in the set. DHS went on to win in straight sets, 25-21, 25-21 and 25-11. During the first set, the Demons (7-9, 3-3 5A/4A Southwestern League) were able to sneak ahead to a quick 11-7 lead after sophomore outside hitter Kyle Rowland delivered an ace. The turning point in the set came at 13-9, when after a long rally between both teams, a ball hit off of a basketball hoop, rolled off and the rally continued, eventually won after senior right side hitter Maura Fitzpatrick tipped it over for a point. The Demons went on a 5-1 run to take the set, 25-21. The second set was just as tight and Durango had to rally back in a big way. After being tied at 9-9 early in the set, the Tigers went on two runs to give them a 17-13 lead before the Demons called a timeout. Grand Junction gained more ground and had the set win within reach, and were ahead 21-16 before O’Ketter stepped in to serve. Head coach Colleen Vogt told her team to stay composed and to run the offense, despite the deficit. Attack, rather than defend. Durango stormed back to win the set 25-21, and that was all the momentum they would need for the final set. Grand Junction (8-12, 1-5 SWL) head coach Jeff Wells thought that his team played well, but could not get the timely points needed to stop Durango’s run. In the final set, it was all Taylor Wolf, as the senior middle blocker registered four of her team-high seven blocks, and had four of her team-high 13 kills as well. After getting down early 0-3, the Demons were able to quickly find its offensive groove, and were able to move the offense through Wolf and O’Ketter. After tying the match at four, Durango went on a 7-0 run. The Demons went on to cruise to a 25-11 final set victory. “(Taylor) has been so solid all of the time for us, both on and off the court, and so it’s really fun when she’s playing well,” Vogt said. 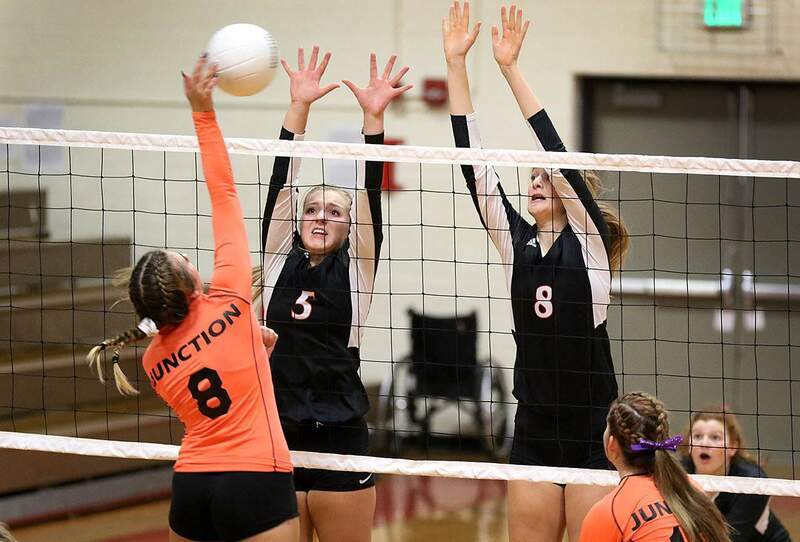 Breck Smith, the Tigers’ senior captain, had seven kills, junior middle blocker Sage Skinner had four blocks and four players registered six digs apiece for Grand Junction. The Demons will end their Southwestern League play next weekend when they will face Fruita Monument at 5:30 p.m. Friday night in Fruita. Then, they will take on Montrose at 11 a.m., Saturday at Montrose High School. Durango Volleyball plays Junction Durango High School Volleyball defeats Grand Junction High School in three sets. 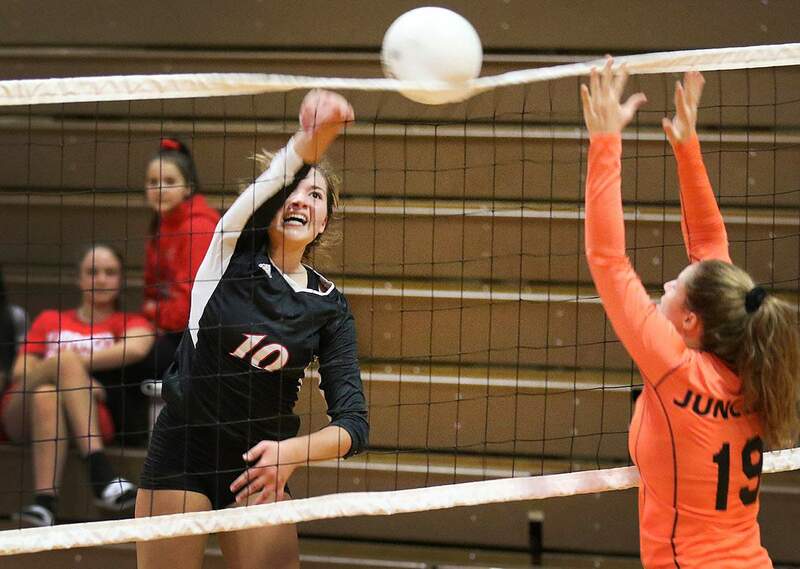 Durango High School Volleyball defeats Grand Junction High School in three sets.